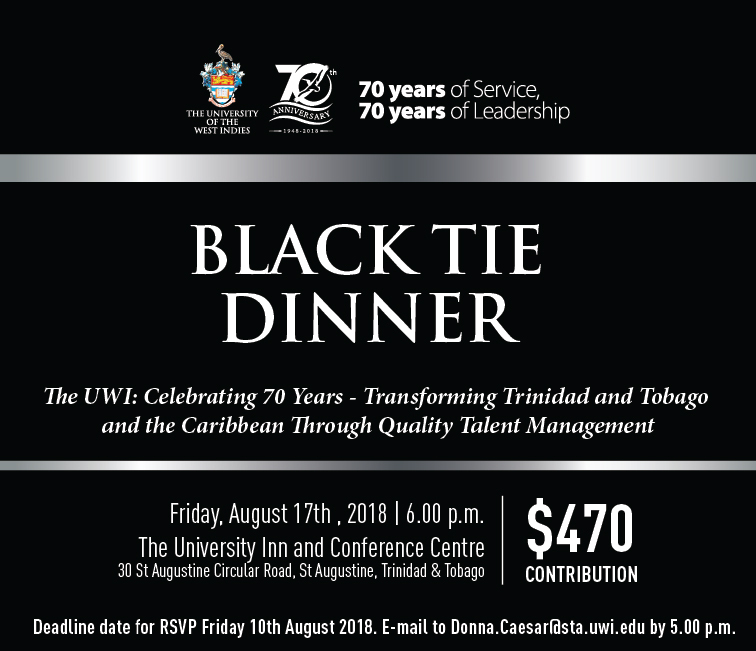 You are invited to The UWI 70th Anniversary Celebration Black Tie Dinner. The deadline to RSVP is Friday August 10 at 5pm. The dinner takes place on August 17, 2018 at 6pm at The University Inn and Conference Centre, 30 St Augustine Circular Road, St. Augustine (To view directions, please click here). Tickets cost $470. Staff can purchase tickets by salary deduction in two installments to be confirmed on or before Tuesday August 7. See the salary deduction form here. To view a printable invitation, please click here. For additional queries, please contact Donna Caesar at Donna.Caesar@sta.uwi.edu.